The Body Shop have teamed up with model Lily Cole to product a cruelty free make up collection. As with all of The Body Shop's cosmetics, it contains no animal products and has never been tested on animals. 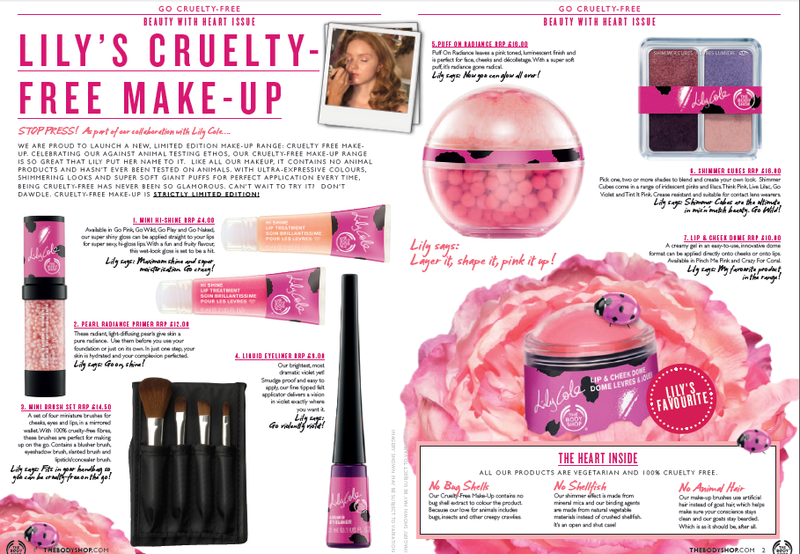 The range is extremely distinctive from the other cosmetics in The Body Shop range as it has a pink and black logo with Lily Cole's signature embossed onto the packaging. Available in Go Pink, Go Wild, Go Play and Go Naked. A primer filled with radiant, light-diffusing pearls to use before foundation or on its own. A set of four miniture brushes for cheeks, eyes and lips in a mirrored wallet. Brushes have 100% cruelty free fibres and perfect for on the go! A bright, dramatic violet liquid eyeliner that claims to be smudge proof and easy to apply. Puff on radiance is a dome shaped compact that contains pink toned, luminescent finish balls perfect for use on the face, cheeks or decolletage. This Shimmer Cube in shade 24 contains eyeshadow cubes in a range of iridescent pinks and lilacs, Think Pink, Live Lilac, Go Violet and Tint It Pink. The lip and cheek dome is a creamy gel in a easy to use dome format that can be applied directly onto the cheeks or lips. 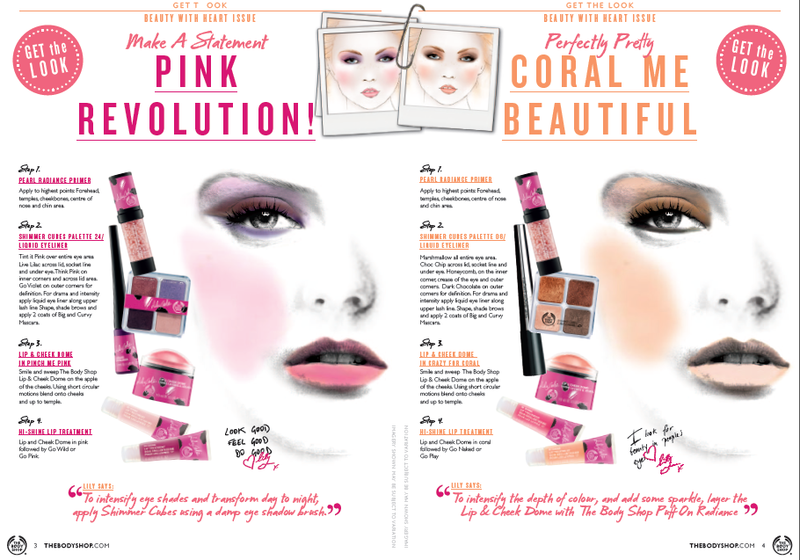 Available in two shades, Pinch Me Pink and Crazy For Coral. I really do like The Body Shop and their cosmetics range so i will be definitely looking out for the Lily Cole Cruelty Free pieces and in particular i have my eye on the pearl radiance primer! The collection will launch in the UK in June online and in stores for a Limited Time only. I love Lily Cole and it looks like such a pretty collection, so I will definitely be having a nose at it! Very cute and I love the fact it's cruelty free. Bit of a shame it's only for a limited time though, I'll have to remember to have a nose! Wow I am so impressed at this! I adore Lily so I cannot wait to get a ton of this, and the packaging is adorable. Wow! This range looks FAB! I love the idea of the puff on radiance! I love Lily Cole and this new collection looks amazing! I would definitely like to try the lip treatments in particular! Really nice ! I love it!! This looks great! I'll be checking this collection out!